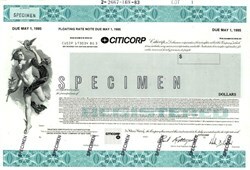 Beautifully engraved specimen certificate from the Citigroup printed in 1983. This historic document was printed by the American Banknote Company and has an ornate border around it with a vignette of Mercury. This item has the printed signatures of the Company's officers. Citigroup Inc. or Citi is an American multinational banking and financial services corporation headquartered in Manhattan, New York City. Citigroup was formed from one of the world's largest mergers in history by combining the banking giant Citicorp and financial conglomerate Travelers Group in October 1998 (announced on April 7, 1998). As of January 2015, it is the third largest bank holding company in the US by assets. Its largest shareholders include funds from the Middle East and Singapore. At its height until the global financial crisis of 2008 Citigroup was the largest company and bank in the world by total assets with 357,000 employees. In 2007, Citigroup was one of the primary dealers in US Treasury securities. Citigroup had the world's largest financial services network, spanning 140 countries with approximately 16,000 offices worldwide and holds over 200 million customer accounts in more than 140 countries. Citigroup suffered huge losses during the global financial crisis of 2008 and was rescued in November 2008 in a massive stimulus package by the U.S. government. On February 27, 2009, Citigroup announced that the US government would take a 36% equity stake in the company by converting US$25 billion in emergency aid into common stock with a US Treasury credit line of $45 billion to prevent the bankruptcy of the largest bank in the world at the time. The government guaranteed losses on more than $300 billion troubled assets and injected $20 billion immediately into the company. In exchange, the salary of the CEO was $1 per year and the highest salary of employees was restricted to $500,000 in cash and any amount above $500,000 had to be paid with restricted stock that could not be sold until the emergency government aid was repaid in full. The US government also gained control of half the seats in the Board of Directors, and the senior management was subjected to removal by the US government if there were poor performance. By December 2009, the US government stake was reduced to 27% majority stake from a 36% majority stake after Citigroup sold $21 billion of common shares and equity in the largest single share sale in US history, surpassing Bank of America's $19 billion share sale one month prior. Eventually by December 2010, Citigroup repaid the emergency aid in full and the US government received an additional $12 billion profit in selling its shares. US Government restrictions on pay and oversight of the senior management were removed after the US government sold its remaining 27% stake as of December 2010.